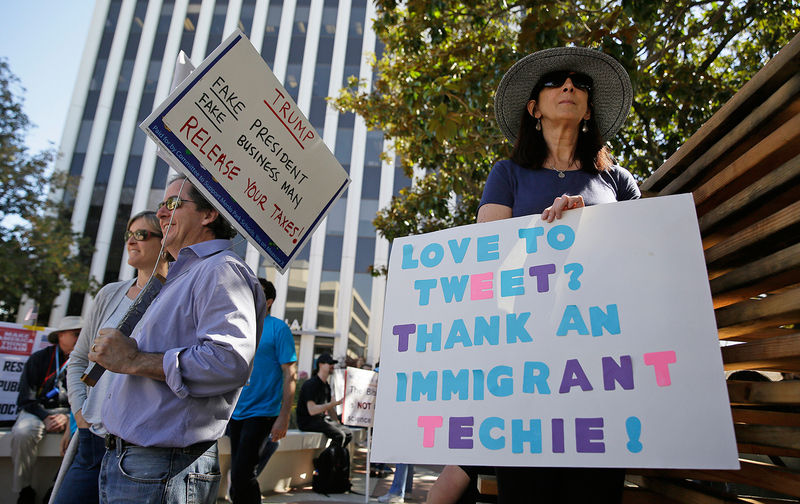 Can Engineers Change Silicon Valley’s Political Agenda? An interview with Maciej Cegłowski from Tech Solidarity. Maciej is also the main force behind Tech Solidarity, a grassroots group that has hosted meetings with hundreds of tech workers across the country to mobilize their technical and financial resources against the administration’s agenda. We talked to Maciej about how tech workers can organize not just to defeat Trump, but to transform their industry as a whole. What is Tech Solidarity, and how did it get started? It started by being frustrated on Twitter right after the election, and feeling like we were all just complaining. So I put out a call to see if anyone wanted to meet up in person and have a discussion. Once there was enough interest, I decided we should get a space. And then it seemed like we should get some speakers. So it was very ad hoc. We had 60 days before the inauguration, and it seemed important to lay the groundwork for whatever was going to happen, rather than just waiting passively and feeling more and more anxious. How many cities have hosted Tech Solidarity meetings so far? San Francisco, New York, Boston, DC, Chicago, Seattle, and Portland. Seven cities and 10 or 11 meetings total, ranging from 60 to 100 people each. How do the people who attend the events in each city hear about it? Do they sign up in advance? I’ve made it intentionally a little bit difficult, to try to filter out people who don’t like difficult things. Why make it difficult? What’s the purpose of introducing a bit of low-tech friction into the organizing model? I think tech people have a tendency to solve problems from first principles, to assume that because we’re really good at controlling the world in our computer that the outside world can be analyzed in a similar way. So there are some bad mental habits that we form as tech people. Zeynep Tufekci has written about this paradox with online organizing: The Internet makes it easier to organize a giant march, but it also makes it easier for the momentum to fizzle out afterwards. When you had to really work to get people out in the streets, that process of organizing left an infrastructure behind that was valuable. As tech people, we tend to want to have the maximum effect. So rather than meet someone one-on-one, we want to build a platform, we want to see results quickly, we want to mechanize everything. So part of my struggle is to get tech people not to mechanize everything and to just do the work. That said, we do have some magic to offer. There are things that activists are doing—data entry, for instance—that can be automated and streamlined, which would make their lives vastly easier. It’s difficult to see duplication of effort as a tech person and not want to immediately fix it. What kinds of speakers are you hosting in the different cities? We try to get speakers from organizations working with vulnerable populations, like immigrants and refugees. We’ve had the National Domestic Workers Alliance, the Brooklyn Bail Fund. We’ve had labor organizers. We’re trying to find contacts in the black community in New York and Chicago. The biggest Islamic ethnicity in America are African Americans. We tend to think of Islam as just an immigrant issue, but it’s not. Plus, for the black community, this isn’t their first rodeo. A lot of us are shocked at having a government that doesn’t represent us and that we’re afraid of. That’s not a new experience for a lot of our fellow Americans, so we should probably talk to them. I know that you’ve also been using these meetings to explore the possibility of forming a tech workers’ union. You’ve been talking to labor lawyers, and you’ve been asking folks who work in tech to send you their employment agreements. Why is a tech workers’ union important, and why now? The problem is that we don’t have many levers of control over big tech companies. The traditional stuff doesn’t work. Usually, if a company is doing something a lot of people think is unethical, you can boycott them. You can’t really boycott Google or Facebook. You’re not their customer to begin with. Their customers are advertisers and publishers. Also, they’re monopolies. They’re centralized and they benefit from network effects. Boycotting them means cutting yourself off from the online world. People just won’t do it in numbers. And shareholder revolts won’t work because these companies are structured so that the founders always have full voting rights. Zuckerberg is going to run Facebook no matter if he only has one share. That’s how it’s written. As for the media, the press isn’t going to say anything bad about Facebook or Google because those are the main outlets for journalism right now. That really just leaves the employees. Tech employees have an outsize force because they’re very expensive to hire and it takes a long time to train people up. Even for very skilled workers, it takes months and months to become fully productive at a place like Google because you have to learn the internal tooling, you have to learn how things are done, you have to learn the culture. It’s a competitive job market and employee morale is vital. If people start fleeing your company, it’s hard to undo the damage. So tech workers are a powerful lever. And knowing that fact, it seems unwise not to use the best tools at our disposal. The point isn’t to improve our economic well-being but to pursue an ethical agenda. Why pursue that ethical agenda collectively, as opposed to individually? There’s safety and power in numbers. A lot of people in the industry are on H1-B visas, for example. Let’s say you’re on an H1-B visa and you do something like sign the Never Again pledge, which says you won’t build personally identifying databases for the government and that you’ll quit if you have to. If you end up quitting, you don’t even get a day off. You have to go immediately to the airport. You’re out of status right away. But if you were to join a strike, then you’re protected and you can’t be fired. There’s a lot of protections that kick in. They’re enshrined in labor law and people fought really hard for them. And it seems silly and imprudent not to use those tools given that they’re there. We have to figure out how to use them, of course, because labor law is written for 1952 assembly lines and not for the tech industry, where there’s a lot of contractors, and a lot of people who are technically managers but are actually on the side of the workers. But I think those are surmountable obstacles. It requires a bit of a hacker’s approach, using labor law for goals that are different than what it was designed for. But that’s why I’m collecting employment agreements, because we need to get into the details if we want to build something union-like for tech. How important is it for this kind of organization to be structured like a union? Could it look like something closer to a professional association? There’s really room for both. Unions would be company-specific, and there are different concerns in different places. But the overall idea is that employee opinion would have a voice in what the company is doing. When you talk about the auto industry in America, there’s the face of management and there’s the face of the workers, represented by their union. Right now tech is represented by VCs and CEOs—the sort of people who went to Trump Tower for that meeting. And those of us who are actually doing the work are not the face of our own industry. As far as governance, these companies are all structured as if they were startups with three employees. At Facebook, one person calls all the shots even though it’s a global social network serving more than a billion people. And I think we’ve seen that we can’t trust these companies to always have morally competent and courageous people in positions of power. We need more robust lines of defense for our politics. These companies have enormous influence and they shouldn’t be governed by the whims of one person. I would like for our industry to be more like librarians. Librarians have a sense of who they are as a profession. They have a central ethical code around patron privacy. The current Librarian of Congress fought John Ashcroft and was ridiculed by him for the idea that people have a right to read what they want to read without it being reported to the FBI. When you go to library school, you absorb this. If you violate it, you’re shunned by your profession. And no one’s bringing in Ukrainian librarians to circumvent it—it’s not like they’re going to offshore library science to get around patron privacy. You see this in other fields. Doctors say do no harm. Journalists—in theory, at least—are trying to speak truth to power. But we in the tech industry don’t have anything like that. We need some kind of professional identity about who we are and why we do what we do. It can’t just be about “moving fast and breaking things” or not being evil. We need an organization that takes collective action on behalf of its employees and ensures their voice is heard in major decisions affecting the lives of millions of people. Decisions that determine how data is collected, how it’s stored, and what rights people have to it. So in this model, these workers would represent the public interest within large tech companies? I think the metaphor of public health is a useful one. Public health is something that affects all of us. Sanitation is important. We count on the Centers for Disease Control and Prevention to do difficult technical work that is subtle and hard to explain. We also rely on them to tell us to use gauze masks or to wash our hands or to report it at the airport if we fly in from certain countries. They communicate messages of vital importance to public health. When it comes to online privacy, it’s unreasonable to ask people to make decisions all by themselves, given the complexities of the technology—especially when they’re irrevocable decisions. To give you a specific example: A lot of people heard about the Women’s March on Facebook. And now Facebook has a list of everybody who said they would attend. It’s stored somewhere, and someone controls access to it. And it’s going to live as long as Facebook does. That’s a pretty irrevocable decision to make about having your name be associated with a political event whose significance you might not even be able to predict. Maybe the Women’s March drove Trump nuts and he’s going to take reprisals two years from now. These are the kind of things that you really need people within the tech industry for. We need to speak up for a general public that does not and should not have to understand how data is collected and managed and stored. Because it’s a very difficult topic, even for domain experts. Just like doctors make decisions about how the water supply is kept safe, tech people need to make decisions about how to keep technology safe. How much do tech workers think of themselves as workers? How much do they think of themselves as labor in relation to capital? I was reading the other day that the median salary at Facebook is $150,000, but that Facebook employees generate $1.9 million in revenue annually per person. Are tech workers aware of that gap? We don’t want to be obnoxious. We’re in an industry that’s still really well-paid. I think people are reticent to form a union if the perception is that they’re trying to get even more for themselves in an already cushy industry. What about the workers who are less well-paid—the bus drivers and security guards and cafeteria staff in tech offices? Do tech workers think of those folks as fellow workers? I think we’re starting to understand the definition of tech worker a bit more broadly. Workers at Amazon aren’t just the people who write the code or run Amazon Web Services. They’re also the pickers in the warehouses—those are also tech workers. The services that tech companies provide can’t exist without this kind of labor hidden behind computer interfaces. And part of what I’m seeing is that tech workers are increasingly concerned that we not leave our fellow workers behind. I think tech workers are happier to see themselves as workers if we make sure that the definition includes people who traditionally have not fallen into it. Also, having a really transparently labor-hostile government under Trump helps people clarify their thinking. To the extent that tech leaders are willing to work with Trump, it shows where they stand as well. It’s a useful polarization. Is there fear of employer retaliation among tech workers who speak out on these issues, or who organize internally to prevent their companies from collaborating with Trump? There’s a lot of latitude in what projects you’re assigned to and what kind of teams you work on, so there’s a lot of room for pressure. There’s also a lot of self-imposed pressure, where people just don’t want to make waves. We’re traditionally apolitical as an industry, and people don’t like political agitation in the workplace. So it’s a struggle to introduce it. And these companies are big—there’s a lot of Trump supporters there. At Google that’s certainly the case. They’re a minority, but they’re there, and I understand management wanting to keep a lid on those internal tensions. What should be the biggest priority right now for tech workers who want to stop Trump? It’s really important that our industry not collaborate. We need to get everybody off of Trump’s advisory committee. We cannot allow people to sit on the fence. Sheryl Sandberg said she’s going to wait and see what the Trump administration is like. I think we’ve waited and seen. Look at the way the executive order on immigration was put into force. Let’s say you believe all the things in it. You believe that terrorists want to come to America, and that those seven countries pose a particular danger. Even if you believed that, no one would’ve ever implemented the order the way it was done—with planes in the air, with no guidance to anybody in the government, with no plan, with no sense of the repercussions, with no legal review. It was just a vindictive, careless, thoughtless act. To me, that’s the hallmark of Trump. There have been some small movements on that front—Uber CEO Travis Kalanick resigning from Trump’s advisory council, for instance, or Sergey Brin addressing the Google walkout. Pressure from below is having an effect. We’re seeing that if we act in concert and with a specific goal we can achieve it. And it’s very important that we act collectively and have a shared sense of what is important to achieve next. What’s the most important thing to achieve next? Protecting immigrants, refugees, Muslim Americans, and African-American communities is at the center. Those are the people who are most in danger. I would also add trans people to the list, who are already vulnerable even without the additional political pressure on them. So the immediate goal is standing up for those groups—not just because they’re our co-workers ut because that’s the right thing to do. And we can use the powerful tools of tech to fight that fight. Something I struggle with is, how do we find a way to fight on so many different fronts simultaneously? There is so much at risk right now, and the threats feel like they’re coming from all directions. It’ll be a big challenge. We need to make sure we’re not just responding ad hoc to every single crisis, but are building some sort of longer-term skeleton. Part of the reason I’m doing things the way I’m doing them is to have continuity between fire after fire. Otherwise people are going to get exhausted and feel helpless. One practical thing that we as techies need to do is to ensure that all the people we’re working with are as bulletproof as possible from a technical security perspective. We need to help them use tech tools in a way that won’t get them on the front pages of the newspaper. But that also requires a trusting relationship. You can’t just have a stranger come in and show you how to use Signal and configure your laptop. In other words, we’ve gotta build points of human contact. We’re not really good at that in tech. We’ve gotta get good.